Since people ask me about stretching frequently, I figure I should write something about it here. I’ll break stretching in to two categories: injury prevention and flexibility. I encourage everyone to stretch for injury prevention. Flexibility is for those who are a little more masochistic. Whether you are stretching for flexibility or health, there are a few main elements to keep in mind. The most important of which is self-awareness. Self-awareness does not just mean knowing whether something hurts; it is much more holistic. While stretching, remember how tired you are, how much you have exercised, what exercises you did, etc. These, as well as other factors, should affect the way you stretch. Self-awareness also means that you should understand what you body is telling you. The most important factor is pain, which unfortunately is a necessary part of stretching. It is important to understand the difference between good pain and bad pain. For example, stretching an injured muscle will feel different from stretching a healthy muscle. Stretching a healthy muscle and “over-stretching” a healthy muscle feel different too. I can not tell you the difference in feeling, so it is up to you to develop this sense. Tangential to self-awareness is body temperature. Your flexibility changes with your body temperature and the amount of physical exertion you have completed. I am sure most of us know that stretching when you body is cold and when you have just finished a workout is different. I really want to accentuate that point here because many people still do not take this aspect seriously when stretching – especially those people who are trying to build flexibility. It is OK to stretch cold (when you have not exercised), but stretching at that time is different from stretching after a warm-up or workout. If you are stretching cold do not push yourself too much. Stretch your ligaments, tendons and muscles until they are tight but you should not make them hurt. Stretch slowly, do not bounce, jerk or pull tendons or muscles taught suddenly. Stretching cold is a good time to isolate tendons or muscle groups. By making subtle adjustments to your body’s position you can stretch different groups. If you have an injury, even a little one, this is a good time to find it and stretch it, carefully. Stretching cold is NOT an opportunity to increase flexibility. It is a time to build self-awareness and prevent injury. Some people really like stretching cold before a workout, but I recommend stretching after a warm-up, if not a workout. Scientific studies show that stretching cold does not reduce the chances of an exercise related injury during a work out. I suggest you warm-up first and then stretch. The warm-up gets your blood flowing and increases your flexibility. Stretching afterwards allows you to reach your current flexibility limits and prepares you for more exercise later. It is important to remember that a warm-up should warm up all the parts of your body which you are stretching. If you warm up your core (torso, chest, stomach) and then stretch your Achilles heel, you might as well stretch cold. A warm-up should warm up either your whole body or at least the parts of you body you will stretch. There is a very specific reason post-workout stretching is different from stretching after a warm up. After sustained exercise for a fixed amount of time (most experts say 20 to 30 minutes) your body starts to produce a type of chemical called endorphins. These are essentially your body’s natural pain-killers and are chemically similar to heroin and the neurotransmitters that are released from its use. In addition to the strong blood-flow created by the workout, these endorphins make stretching really effective. Basically, they just make you hurt less. The increased blood-flow and natural stretching you did during the workout has already pushed your body to its natural level of flexibility. As a result, any stretching you do during this time brings you to your limit and is much more comfortable than regular stretching. Thus, stretching to prevent injury is easy and more effective than any other point in your routine. Some may think that the pain alleviating effects of the endorphins might cause you to stretch too far. This is not likely. Even though stretching may hurt less after a work out, you can still pay attention to the different types of pain. Though reduced, the pain from healthy and unhealthy stretching should feel distinctly different. This brings me to stretching to increase flexibility, which I highly recommend that you do after a workout. This largely due to the same reasons stretching for injury prevention is good to do after a workout. When you have a heroin-like substance racing through your body, I suggest that you go to town on your flexibility. But always remember to stay self-aware in order to prevent injury from over-stretching. I should mention how this affects Capoeira class formats. When conducting class, teachers have to take a lot of factors in to account. Stretching is important but it is not the only factor that goes in to planning a class. Instructors will integrate stretching in to class as it best suits the situation. If the room is cold and no one has warmed up before class, an instructor will start with stretching or a warm-up and then stretching. If it is the middle of summer and everyone has energy, the instructor might just skip stretching altogether. One of the problems we face frequently is the end of class. We always want to push students to learn more material, play in the roda longer or do extra push-ups. That usually means that we miss stretching or that when the roda ends, most people are already cold and stretching is not helpful. If you want to stretch, for any reason, after the workout you can do a little warm-up after class and then stretch. The endorphins stick around in your body for at least 30 minutes. You can get warm, and use the endorphins. As always, I recommend that you come to class early to warm up and stretch a little. This makes it easier to start class and get to the more interesting part of class. That is all I am going to write for now. Please let me know if you have any more questions. Thank you, Lagartixa! Very usefull information. 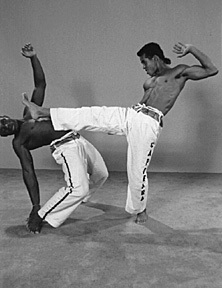 I hope you will write more about “little secrets” in Capoeira. It’s quite obvious that increasing your flexibility becomes harder as you grow older. Is there a time one should give up on making progress, to focus more on maintaining an existing level of flexibility ? Yours is my first comment, so I had to respond. The website tells me as soon as you comment via email. Isn’t that cool? Will I ever get work done again? Anyway, yours is a relevant question. As we get older flexibility decreases. But this means that as you get older, you should stretch more frequently and contiguously. As our flexibility decreases, the chance of injury is greater. Thus, the importance of stretching increases. Also, you lose flexibility faster so in order to maintain your current flexibility, you should stretch more regularly. Separately, you can increase your flexibility at almost any age, you just have to work harder at it as you get older. For most of the group members, including you and me, age shouldn’t really have an effect. It should only make flexibility acquisition a little more painful – it’s more gratifying that way.